Mass biometric surveillance is a new reality at U.S. prisons. 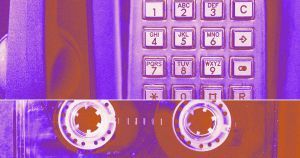 The Intercept published a shocking account Wednesday about how U.S. prisons are building biometric databases of inmates’ voices, in some cases without their consent. Hundreds of thousands of incarcerated people have had their voice prints digitized, according to the report, for the sake of prison security and surveillance — a grim example of how surveillance technologies can enable authorities to create automated panopticons. Inmates were asked to repeat seemingly random phrases into a phone, according to The Intercept, sometimes under the threat that otherwise their phone privileges would be revoked. “It said, ‘Say this phrase, blah, blah, blah,’ and if you didn’t say it clearly, they would say, ‘Say this phrase again,’ like ‘cat’ or ‘I’m a citizen of the United States of America,'” an inmate at New York’s Sing Sing prison told The Intercept. Documents obtained by The Intercept tell a shocking story: prison authorities were storing inmates’ unique ‘voice prints’ in biometric databases in order to create a voice surveillance system, with the goal of monitoring prisoners’ calls. The system even stores voice signatures of call recipients outside the prison. Authorities say the surveillance could help prevent fraud — inmates using each other’s identification numbers to make calls for instance — and beef up prison security. But civil rights advocates are raising flags about the new system: it violates inmates’ rights, they say, especially when data is being collected against their consent.